A pall of gloom descended on the Indian Institute of Science (IISc) campus, where an explosion at the Laboratory for Hypersonic and Shock Wave Research (LHSR) claimed the life of an engineer, and critically injured three others. The blast, which occurred around 2.15pm, could be heard across the campus, according to students who gathered at the lab to find out what had happened. As news of the blast spread through the campus, there was confusion, especially among those who work and study at the department of aerospace engineering. No one seemed to be able to pinpoint what exactly caused the blast, and theories began doing the rounds. The force of the blast was enough to blow away every window of the lab and even affected the roof, which is at least 20 feet high. “Such a blast can occur only with the presence of a fuel,” said one anxious student from the department. For others, trying to figure out who was injured took priority. “We were initially told that the person who died was part of the department, then we found out that it was an M.Tech student. After reaching here, we found out that they are part of a startup,” said Rajesh (name changed), an IISc student who didn’t want to be identified. The presence of a huge media contingent, as well as bomb squad, forensics team, police and reserve policemen, kept most of the faculty and students away. “There definitely need to be stricter safety measures for labs where such work is carried out,” another student said. Professor Jagadeesh, one of the founders of Super Wave Technology Private Limited, the startup the engineers were employed with, was seen moving around the accident site and talking to other faculty. After speaking to the family of the deceased, however, the professor seemed to break down and sat on the steps of the laboratory, as the shutters were downed. According to IISc, the exact cause of the blast will be known only on Thursday. 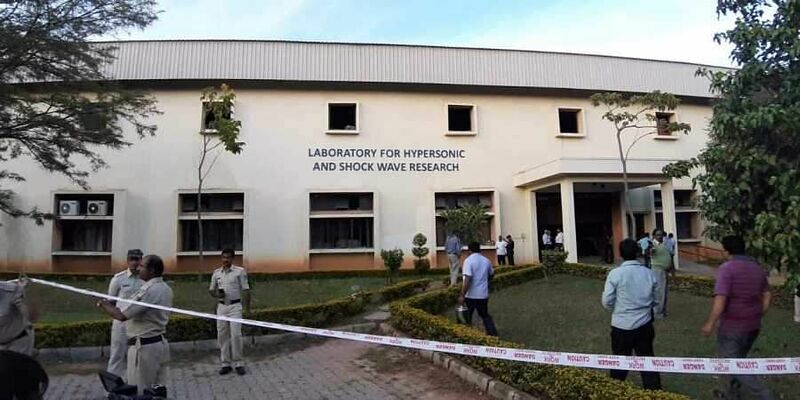 Super Wave Technology Private Limited, a startup founded by Professors G Jagadeesh and KPJ Reddy, from the department of aerospace engineering, was housed at the Laboratory for Hypersonic and Shock Wave Research, and was working in the area of shockwaves and how they could be applied to daily situations as well as industrial ones. They have earlier delivered solutions which allow for drug patches which deliver vaccines, insulin and antibiotics through shockwaves, instead of injections. The company has also worked on solutions for the tea industry. In February this year, the company had signed a deal with ONGC in which the corporation would provide assistance to SWTPL to research the use of shockwaves instead of hydraulic fracturing for shale gas extraction. While hydraulic fracturing would require large amounts of water and energy, shockwaves would be a more efficient method and the possibility of using this as an alternative was being studied. Manoj Kumar (32), from Kollegal in Chamarajanagar district, had been employed by Super Wave Technology Private Technology to work on the project signed with Oil and Natural Gas Corporation (ONGC). According to emergency services officials at the spot, Manoj was in the immediate vicinity of the blast, which resulted in multiple mutilations on his body. Manoj Kumar had married Anusha, from Mysuru, around 10 months ago, and the couple lived near Manyata Tech Park. Two members of the family initially alleged that institute officials were being high-handed in not allowing them to enter the cordoned area or speak to any of the officials on what caused the blast. Family members, who claimed to be related to Kumar’s wife, were seen standing outside the cordon, asking to be let in. “They just called his wife and told her that he had died in an accident. There was no other information. We want to know what safety precautions were in place in an institution of such eminence,” Anusha’s cousin demanded. All the three engineers injured in the blast are admitted to MS Ramaiah Hospital and are critical. The engineers — Athulya Uday Kumar, Naresh Kumar and Karthik Sehnoy are critically injured. Athulya Kumar was in ICU while the other two were being operated upon. Athulya suffered wounds on his face, left shoulder and back. Naresh suffered bilateral puncture wound on his chest, fracture on right arm. Shenoy’s injuries are deep cuts and a suspected injury to lungs. According to the State Fire and Emergency Services, no one from IISc called the 101 helpline, and emergency services reached the spot on their own after seeing media reports. “No one called the helpline as there was no fire. We reached the spot after seeing reports in the media,” confirmed Sunil Agarwal, ADG (Fire). MR Chandrashekar, senior security officer at IISc, said that he was having lunch at his quarters when he heard the blast, as it reverberated even where he was sitting. “I immediately reached the spot and we managed to evacuate one of the engineers to a spot outside the building. The ambulances then took the injured to Ramaiah Hospital,” he said. Fire and Emergency Services officials at the spot said that the explosion could have been the result of a mixing of gases. The laboratory stored industrial size cylinders of oxygen, hydrogen, helium and other gases. However, they added the caveat that the exact cause and safety precautions taken would be known only once the forensics team submitted its report.